The previous flat rate equivalent to US$78/MWh has been increased to US$85/MWh (VND 1,928,000/MWh) for onshore wind and US$98/MWh (VND 2,223,000/MWh) for offshore wind, the ministry of industry and trade (MIT) announced. It added that the new 20-year feed-in tariff (FiT) applies to a part of or all grid-connected wind farms starting commercial operation before 1 November 2021. The prime minister has instructed the MIT to propose and submit plans for an auction mechanism for wind power development beyond that date. Patrick Architta, business development director at K2 Management, which recently opened an office in Vietnam, told Windpower Monthly that the tariff was one of the main obstacles to wind development in the south-east Asian country. Power purchase agreements (PPAs) are signed with state-owned utility Electricity of Vietnam (EVN). However, the government does not act as a guarantor to EVN in case of it defaulting on payment. This risk, Architta explained, often proves unacceptable to international banks. However, private investors and Vietnamese banks are much more capable of taking such aggressive risks, he suggested. Architta added: "As soon as the PPA becomes bankable we will see an acceleration of the installed capacity." Earlier this month, German manufacturer Enercon entered the Vietnamese market with an order for 77MW to be split between two sites in Ninh Thuan province on the country’s south-central coast. 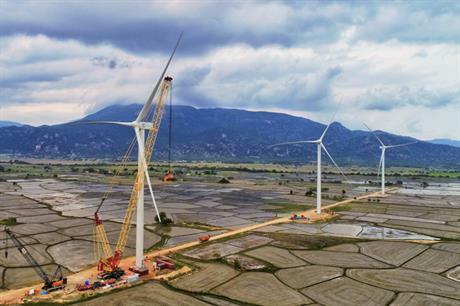 Siemens Gamesa also received an order in Vietnam for 31.2MW in April. Certification body DNV GL and manufacturer MHI Vestas have also formed a partnership with a local state oil and gas group and Singapore-based offshore renewable companies to develop wind projects off Vietnam’s southern coast. In its Global Wind Report released earlier this year, the Global Wind Energy Council (GWEC) claimed the Vietnamese wind market was 'one to watch', noting that the country’s wind resources are among the best in the region and electricity demand is growing by 10% a year. However, it raised similar concerns to K2 Management's Architta about the country's currency risk and lack of local finance. The country’s Renewable Energy Development Strategy for 2016 to 2030 (REDS) envisages 800MW installed by 2020, 2GW by 2025, before ramping up to 6GW by 2030. This capacity increases from today’s low base of 237MW, according to Windpower Intelligence, the research and data division of Windpower Monthly.